I’m skeptical about … arthroscopic knee surgery. It’s a slick procedure, all right; a bit of spinal anesthesia, just 3 tiny incisions, some sophisticated gadgetry, a bit of maneuvering and sloshing, and all done. Zip, zip, zip. The recovery times are short, the complications few, and the whole idea of operating on the knee without any major incisions is just so downright appealing that it’s no wonder arthroscopic surgery is the most common orthopedic surgery performed in America, done almost a million times a year to the tune of more than $5 billion. But does it work? Let’s look at the evidence for 2 leading indications: osteoarthritis and medial meniscus tears. How might arthroscopy help for osteoarthritis, a degenerative process characterized by joint erosions, inflammation, restricted range of motion, and pain? After inserting the arthroscope, the joint is examined, loose bodies removed, and frayed edges of cartilage and bone trimmed and smoothed, before an extensive lavage to flush out any remaining inflammatory crystals and debris. But since osteoarthritis is a chronic degenerative condition there is little reason to believe that flushing out inflammatory mediators in the near term will have much of a long-term effect unless the patient also lessens the stress on the joint by losing weight and/or strengthening the muscles around the knee. Otherwise the same forces that caused the erosions in the first place will simply cause new ones. Despite limited theoretical benefit, millions of these procedures have been performed on folks with arthritis—often to spectacular anecdotal benefit—with everybody happy and the orthopedists making money hand over fist. But it wasn’t until 2002 that we first had any real evidence about whether the procedure actually worked, when a novel study appeared in the New England Journal of Medicine. Somehow doctors convinced 180 veterans from the Houston VAMC to enter a trial wherein patients were randomized into 1 of 3 groups: arthroscopic lavage (washing the knee with at least 10 liters of fluid), lavage with arthroscopic debridement (trimming and shaving the joint), or sham surgery wherein patients were given an anesthetic and surgical incisions made through the skin without actually operating on the joint. In the latter group, surgeons called for instruments as if performing the procedure and even mimicked the lavage by splashing fluid onto the knee and floor. God bless the vets who volunteered for the trial, the doctors who enrolled them, and the hospital’s Internal Review Board that had the intellectual honesty, curiosity, and cajones to approve the study. Neither the patients nor the providers who examined them afterward knew which had received the sham or the real surgery. Patients were examined at multiple intervals for up to 2 years afterward and compared with regard to pain, mobility, and function. And guess what? There were no differences between the groups at any time during the follow up. The sham surgery worked just as well as the real surgery. The only problem with the trial was that it hadn’t included a similar group of osteoarthritis patients receiving no treatment at all. There is a huge placebo effect to surgery and maybe the very fact of having had incisions made around the knee somehow helped the body heal itself. It must be noted that both the sham surgery and actual surgery patients showed marked improvement in pain and function at 90 days. Was it the surgery or the mere passage of time that healed the body? The orthopedists did a lot of hand-wringing in the aftermath. Although they had thousands of testimonials to support their procedure, that pesky little thing called evidence kept getting in the way. In 2008, another landmark study appeared, this one from Canada, comparing arthroscopic surgery and physical therapy versus physical therapy alone for patients with knee osteoarthritis and found, once again, no benefit to surgery. I would offer that this trial suffered from the same flaw as the earlier one in that it hadn’t included a group who underwent no treatment at all. There have been other studies calling to question whether physical therapy is of any value over simply giving patients an exercise pamphlet and having them walk regularly. The bottom line: If walking works as well as physical therapy, which works as well as surgery, then maybe we should simply counsel people with osteoarthritis to lose weight and exercise. Pretty simple, right? Still, the results of these studies were compelling enough that, in 2004, Medicare stopped reimbursing for knee arthroscopy for osteoarthritis. In turn, this led to a 40% reduction in the procedure—but only for osteoarthritis. Although this sounds impressive, I’m not so sure. As it turns out, medial meniscus tears are extraordinarily common and frequently occur in conjunction with osteoarthritis. Knee MRI scans performed in older patients with knee pain reveal concomitant meniscus tears in more than 90% of osteoarthritis patients. In fairness, they are also present in more than three-quarters of older patients without knee pain. So now when surgeons perform arthroscopy on patients with osteoarthritis (not billable) they are almost certain to encounter a meniscus tear (billable), which then becomes the primary diagnosis. And this explains why the total number of arthroscopies continues to rise. Anatomic detail of the anterior knee. Meniscus tears are the most common indication for knee arthroscopy, accounting for nearly half the total. The knee is comprised of 4 bones, 4 ligaments, the joint capsule, and 2 cartilaginous discs—one on the inside (the medial meniscus) and one on the outside (the lateral meniscus). These discs provide shock absorption and cushioning to the articular surfaces of the joint and are susceptible to tears. You do not have to experience trauma to tear your meniscus, just living and walking on the earth for a while can do it. 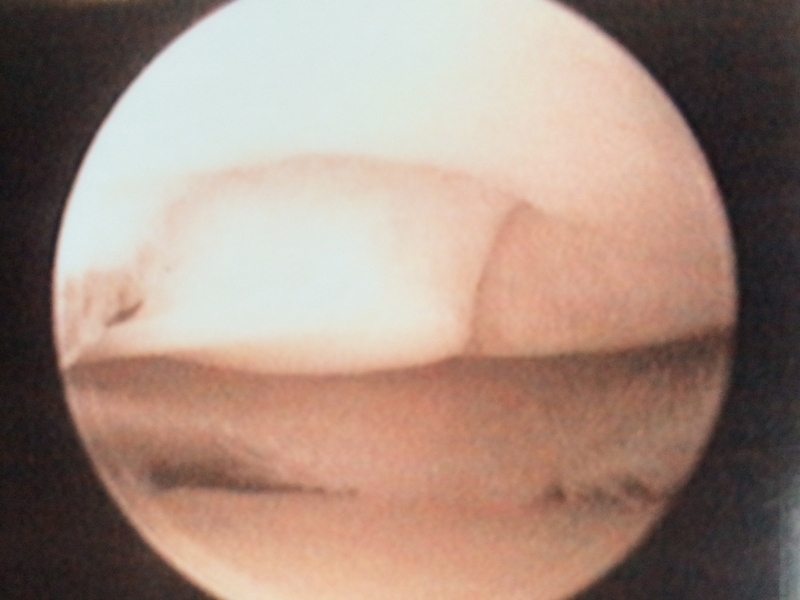 The inside meniscus tears far more often than the outside one. Anatomic detail of the posterior knee. Does arthroscopy for meniscal tears help people? A Swedish study published in 2007 randomized patients with medial meniscus tears on MRI scanning to either arthroscopy and exercise versus exercise alone. The patients were then monitored with regard to pain, mobility, function, activity, and return to recreational sports. After 6 months both groups were markedly better and maintained their improvements over the 60-month study period. Alas, the surgery group didn’t do any better than the exercise group. Again, the orthopedists cried, “Foul!” but when a much larger study came out in 2012 demonstrating essentially the same thing, the door on arthroscopy for medial meniscus tears started to close. The results in both trials were compromised by the fact that patients were allowed to cross over from the exercise group and have surgery if they felt they weren’t getting better and approximately 30% of the participants in both studies flipped. But then a year later, an additional trial also failed to show superiority of surgery over exercise, and in this study only a single patient crossed over from the exercise to the surgery group. As 2013 came to a close so did the evidence for arthroscopy to treat medial meniscus tears, when a large trial from Finland was published in the New England Journal of Medicine showing that actual surgery for meniscus tears was no better than sham surgery. The results were very similar to the trial published 11 years earlier from the Houston VAMC that closed the door on arthroscopy for osteoarthritis. In the former case, it took 2 years after trial results showed no benefit before Medicare reimbursement for arthroscopy for osteoarthritis was cut and 11 years before the AAOS (American Academy of Orthopedic Surgeons) finally recommended against it. With meniscus tears now the leading indication for reimbursable arthroscopic knee surgery, how long do you think it will take this time? This is not to say that arthroscopy isn’t the best type of surgery for other indications like ligament repair or traumatic meniscus injuries, but the data for osteoarthritis and non-traumatic medial meniscus tears looks bleak. Caveat emptor. Final note: As a high school basketball player I underwent an open meniscectomy on my right knee and had additional arthroscopic surgery 15 years later. Neither procedure helped me. It’s unlikely that I’ll risk another. But I will keep exercising. Stay healthy my friends. Arthroscopic photo of the author’s knee. Note the chondral fracture just to the right of center on the distal femur. Bruce Moseley et al., “A Controlled Trial of Arthroscopic Knee Surgery for Osteoarthritis of the Knee,” NEJM 2002; 347 (2): 81-88. Alexandra Kirkley et al., “A Randomized Trial of Arthroscopic Surgery for Osteoarthritis of the Knee,” NEJM 2008; 359 (11): 1097-1107. Sylvia Herrlin et al., “Arthroscopic or Conservative Treatment of Degenerative Medial Meniscal Tears: A Prospective Randomised Trial,” Knee Surg Sports Traumatol Arthrosc 2007; 15: 393-401. Jeffrey Katz et al., “The MeTeOR Trial (Meniscal Tear in Osteoarthritis Research): Rationale and Design Features,” Contemporary Clin Trials 2012; 33 (6): 1189-96. Jeffrey Katz et al., “Surgery Versus Physical Therapy for a Meniscal Tear and Osteoarthritis,” NEJM 2013; 368 (18): 1675-84. Ji-Hyeon Yim et al., “A Comparative Study of Meniscectomy and Nonoperative Treatment for Degenerative Horizontal Tears of the Medial Meniscus,” Am Journal Sports Med 2013; 41 (7): 1565-70. Raine Sihvonen et al., “Arthroscopic Partial Meniscectomy Versus Sham Surgery for a Degenerative Meniscal Tear,” NEJM 2013; 369 (26): 2515-24. Moin Khan et al., “Arthroscopic Surgery for Degenerative Tears of the Meniscus: A Systematic Review and Meta-Analysis,” CMAJ 2014; 186 (14): 1057-64. This entry was posted in Uncategorized and tagged arthroscopic knee surgery, knee osteoarthritis, medial meniscus tears. Bookmark the permalink. ← I’m skeptical about … multivitamins. Sorry to hear of your troubles. The problem with knee injuries (and back and hip injuries) is that they are typically multi-factorial, meaning that there are a combination of issues (tendons, ligaments, bursa, and bone) leading to ongoing symptoms of pain and dysfunction. After 4 years, surgery seems in order, even if an MRI fails to show a definitive lesion. Good luck with the rehab!